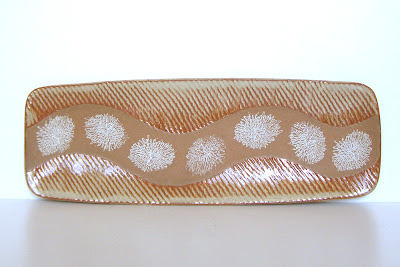 Karen Mahoney of City by the Sea Ceramics has been a member of Boston Handmade since January 2010 and she is as hard working an artist as can be. Karen participates in craft fairs and art shows every month, and sometimes every week. She recently set-up a ceramics studio in her own home and is a full-time potter. BH: Karen, we know that you have a beautiful line of pots - - wheel thrown, hand built, and fired with Raku and sawdust techniques, but when and how did your interest in ceramics begin? KM: I first worked with clay about ten years ago as a student and wanted to follow a career in pottery then but talked myself out of it. I wasn't around clay for a few years but got back into it when I moved to Massachusetts and began a job at a local studio. I loved it again and decided I did want to pursue it after all instead of getting a degree in art history, which was the plan when I moved here. BH: You participate in many local craft fairs and sell your work online, but in this leaner economy when people are spending less on "luxury items" how do you sustain your business? KM: It seems to me that people are finding the small pleasures and embracing them. Drinking from a cozy handmade mug filled with some really good coffee you made at home every morning is still a luxury and a bargain compared to dropping $3 every morning getting coffee out. At the same time I think there is an excitement right now for handmade items, people are buying things with more awareness of who made it and where it came from. Shoppers are being more mindful about their purchases and wanting to shop with people they can connect with. BH: Have you ever explored other types or art making, other mediums besides clay? KM: I really like painting with oils and drawing with charcoal and oil pastels but haven't done any of it in a long while. These days it's more knitting and random craftiness, like weaving a basket with the velcro strips that come around my heads of lettuce. BH: You recently had a big life change in the form of a move and separation from your long-time studio, how is the new set-up working out for you? How is the new studio experience different from the old one? KM: There are definitely challenges setting up a studio for the first time and doing without the large space and really nice equipment I had access to, but I still wouldn't trade it back. There were challenges at the old studio too, just very different ones. Having my own space allows me more freedom, sanity, and focus, three things I really need and get cranky if I don't have. BH: Ok, admittedly this is kind of an annoying college essay/job application question, but we're dying to know: you've accomplished so much in recent years, exhibiting your work internationally, having your work included in well known publications, so where do you see your work in 5 years? KM: I'm always getting better and see it in my work constantly. My style is also evolving over time, so I'm very excited to see where it is in 5, 10, even 20 years. While I notice this progression more, I sometimes have a hard time seeing how far I've come with accomplishments because I'm focused on how far I still want to go. Yes, I'm in books, magazines, and have exhibited abroad, but I've got my eyes on bigger books, magazines, and exhibits. So hopefully, in 5 years I will have progressed enough to get me to these greater goals and will be running down that path.